The 2019 Women’s International Four-Ball begins on Wednesday at The Wanderers Club in Wellington, Fla.
TAMPA, Fla. – The Florida State Golf Association Championship season will get underway this week in Wellington, Florida, with the 72nd Women’s International Four-Ball at The Wanderers Club. This historic championship is the last stop on the Orange Blossom Tour, after the Harder Hall, SALLY and Ione D. Jones/Doherty. Here are five things to know before the championship begins on Wednesday. The 2019 field is made up of some of the best amateur golfers in the country. Twelve players in the field have combined to win more than 15 USGA Championships, while there are 16 FSGA champions. Ellen Port holds the most USGA titles in the field with seven. The Missouri native has won three U.S. Senior Women’s Amateurs (2012, 2013, 2016) and four U.S. Women’s Mid-Amateurs (1996, 1996, 2000, 2011). She has also represented the USA in the Curtis Cup twice (1994 and 1996) and captained the team to victory in 2014 at St. Louis Country Club. 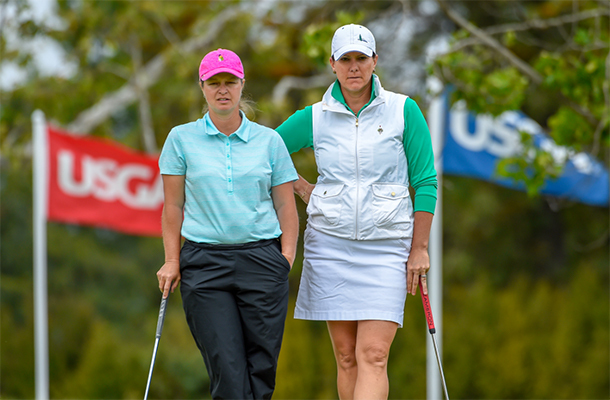 Port will be playing with the 2018 U.S. Senior Women’s Amateur champion, Lara Tennant. Diane Lang, who will be competing with Therese Quinn, is a three-time USGA champion, winning the Senior Women’s Amateur in 2005, 2006 and 2008. Lang is also a three-time FSGA Player of the Year. The 2018 U.S. Women's Mid-Amateur champion, Shannon Johnson, will be competing with fellow Massachusetts native, Megan Buck. Lauren Greenlief and Katie Miller captured the 2018 championship, with a five-stroke lead over the rest of the field. The pair is looking to become the eighth team to win two-straight International Four-Ball Championships. 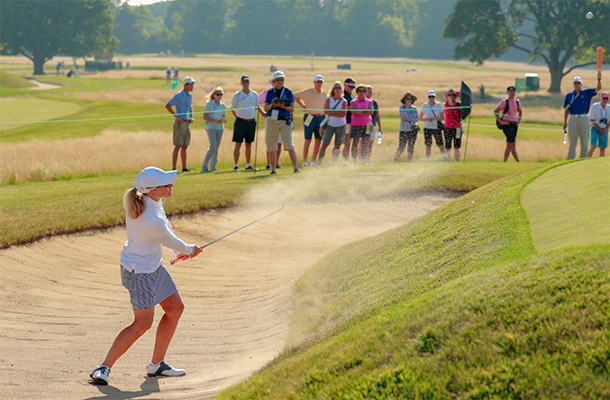 Greenlief, a Virginia native, became the youngest winner (25 years, 25 days) of the U.S. Women’s Mid-Amateur Champion in 2015 and reached the semifinals of the 2016 U.S. Women’s Amateur Four-Ball. Miller is coming into the championship as a three-time defending champion, after also winning the event in 2016 and 2017 with Charlotte Daughan. The Jeannette, Pa. native advanced to the quarterfinals of the 2016 U.S. Women’s Mid-Amateur. This year’s field includes six past FSGA Players of the Year. Seven-time Player of the Year, Meghan Statsi will look to claim her fifth International Four-Ball title, with partner Ina Kim- Schaad. The Ft. Lauderdale, Fla. native most recently won the event in 2014 with Tara Joy-Connelly, the 2015 FSGA Player of the Year. Stasi is a four-time U.S. Women’s Mid-Amateur champion (2006, 2007, 2010, 2012) who represented the USA in the 2008 Curtis Cup Match on the Old Course at St. Andrews in Scotland. Mary Jane Hiestand, who is also a seven-time FSGA Player of the Year, will be competing with Judith Kyrinis, the 2017 U.S. Senior Women’s Amateur Champion. The pair finished in a tie for fifth place at last year’s championship. Hiestand has competed in 45 USGA championships, while making four appearances in USGA inaugural championships – 1987 Women’s Mid-Amateur, the 1995 USGA Women’s State Team Championship, the 2015 Women’s Amateur Four-Ball and the 2018 Senior Women’s Open. Taffy Brower, FSGA Hall of Fame member and 2004 FSGA Senior Player of the Year, will be playing with JoAnn Ferrieri. While the 2015 Senior Player of the Year, Gigi Higgins, is teaming up with 2018 Senior Match Play Champion, Lin Culver. Fifteen states will be represented at this year’s championship, with 29 players hailing from outside the state of Florida. Kyrinis and Jackie Little, both from Canada, are the only international players in the field. Other than Florida, Texas is the most represented state with seven players, followed by Massachusetts with four. The Wanderers Club will play host to the Women’s International Four-Ball for the seventh year in a row. The Palm Beach Country club is a challenging and unique Jacobsen Hardy design that is located in Palm Beach, North America's premiere equestrian community.